was founded by Jeremy Alexander and Randall Alexander, a father and son team. They began their journey more than seven years ago, and have continued to grow and expand their knowledge and customer base thanks to the great family of customers that are loyal to Alexander Homes. We love building decks, porches and patios, and take great pride in the projects we build and the personalized service we provide. Serving Kansas City, Independence, Johnson County and all surrounding areas. We are fully insured, and will be more than glad to provide references upon request. During the design phase we bring samples of decking materials so the homeowner can actually see the product and learn about the material properties and characteristics. 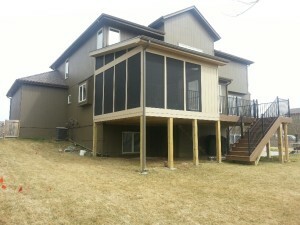 We encourage homeowners to review photos of different types of deck styles and designs in order to choose the features and styles they like best and that best fits their needs. Our message to the homeowner is to take the time up front in the design phase in order to get exactly the style and shape of deck that they desire. Shapes and styles have gone beyond the typical single level, square and rectangle to include multilevel, round, oval, or octagonal renditions. With all the different types of decking materials on the market, sometimes it is difficult to decide which is the best or most appropriate choice. Here you will find some idea of the number and different types of materials that are available. Not to worry, there are only about half a dozen types that we would recommend. By clicking on the following logos, you will be able to learn more about that product from the manufacturers website! 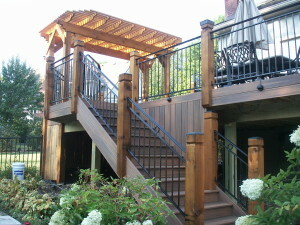 "Our decks they look fantastic! We'd be glad to give a reference for Alexander Homes!" We'll contact you for the info we need!